Everyone knows Batman is well read and a master detective! 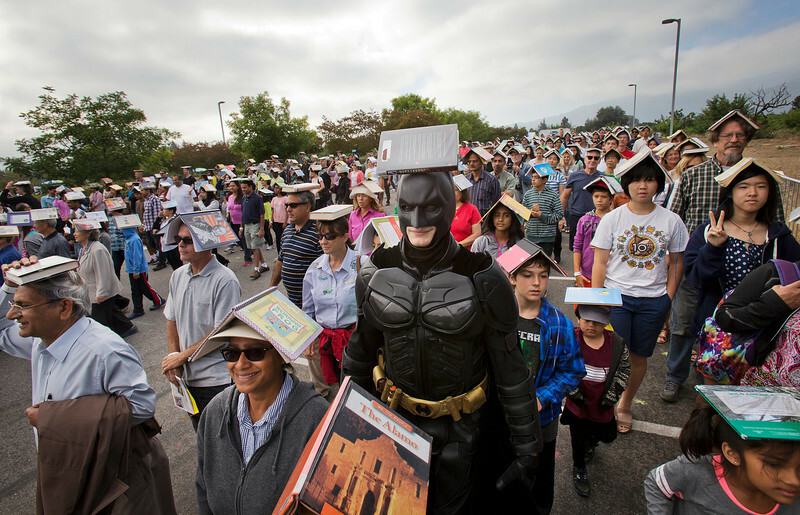 Bay Area Hero came out to celebrate reading and the 100th Anniversary of Santa Clara County Library District by taking part in a Guinness World Record attempt. "At center, Lucas P., known as the Bay Area Hero, participates in a Santa Clara County Library District event to break a Guinness World Record at the Saratoga Library in Saratoga, Calif., on Saturday, Sept. 6, 2014. The Santa Clara County Library District celebrated its 100th anniversary trying to break a Guinness World Record by having over 1000 people simultaneously balance books on their heads while walking five meters. Pastuszka was among the 609 people who participated in the walk. (LiPo Ching/Bay Area News Group)"